The craft fair was a good event from my perspective, and I did actually make a profit of £2, which isn’t bad considering it’s the first time I’ve sold at any sort of craft fair, or any other event for that matter. I need to say a big thanks to Angela, my co-conspirator, who was an immeasurable help to me both on the day and in planning for it. I’ve been a bit stressed and busy with preparing for the craft fair, so I haven’t been keeping up with other stuff, including this blog. To make up for that, I’m doing a give away! I figure people who read this blog are probably interested in making stuff, so may like to have some of these to finish decorating, either according to my instructions or in any way that appeals! 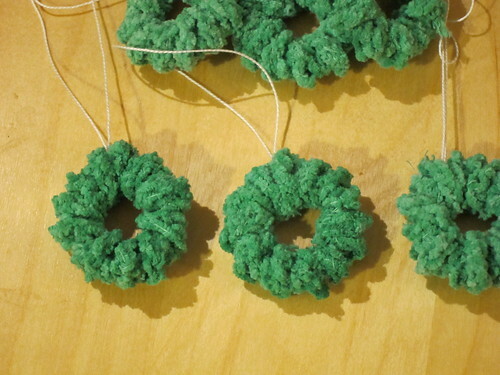 So if you would like to try your hand at decorating a mini wreath (or a half dozen for that matter), leave a comment with your email address so I can get in touch. I won’t publish the email address- the blog is set so I have to approve comments, and I won’t publish any comment with an email address. It’s a first come, first serve offer, so get ‘em while they last! Also, for those who read my blog, I’m looking into changing to a different blogging service, for purely financial reasons. So sometime soon the blog may be ‘moving house’. Hopefully it won’t be too traumatic.